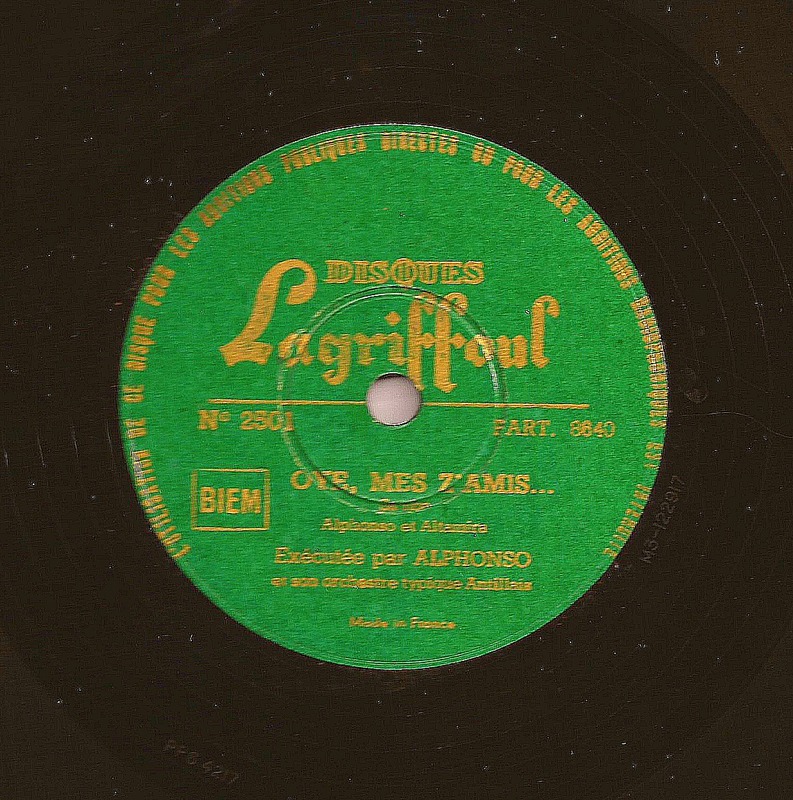 This track called “Oye, mes z’amis…” is a samba performed by Louis-Jean Alphonse, aka Aljean and Alphonso, and his orchestra. I didn’t find a lot of information about this musician, who was born in 1905 in Martinique, a French island in the Caribbean Sea. According to this short biography, Alphonso started playing the piano in the 20’s in Paris. Later on, he played in several orchestras and contributed towards popularising biguine style in France in the 50’s and 60’s. You can find more information about the biguine scene in Paris here. There’s an excellent compilation called Au Bal Antillais which contains some fantastic tracks by Alphonse, but this one is not on it. Two of my most prized 78s are biguines from Martinique: Mlle Estrella & l’Orchestre du Bal Antillais “Ninon/Femme Qui Dou” Odeon 238.141 and Orchestre De La Boule Blanche “C’est Biguine/Maladie D’amour” Columbia DF 428. Thank you for posting this. Thank you ! I have some other biguines records, I plan to post some of them later. I’ll try find this compilation, thanks for the advice! Thanks for your link Yoyo ! great blog! happy to have found it, love what you ‘ve uploaded ! Merci pour ton commentaire ! Je découvre ton blog également, je l’ajoute de suite à ma blogroll ! Thanks ! I saw these records when you posted your first comment. You own a very nice collection ! Thank you !